Mexico thrives on radicalism. The very word revolution conjures up the incredible vitality of a country where conflicts and political upheavals have peppered the calendar since pre-Hispanic days. The latest mutation is quite different, however, as it is all about a strengthening of national identity, or Mexicanidad (Mexican-ness). Visible in a resurgent avant-garde culture, nourished by Mexico’s baroque imagination and deep soul, a new confidence is permeating every field from cinema to music and art, placing Mexico firmly on the creative world map. Not least, it is transforming the food. With immense flair, modern chefs now combine extraordinary native flavors with a sophisticated sense of balance and presentation. By layering rare, ambrosial flavors in presentations of sheer poetry, Mexican chefs are hitting the headlines: the gastro revolución is upon us! Yet rather than a revolution, it has been an evolution. What is happening is a complete reappraisal of food traditions that had come to be regarded as old-fashioned and even backward. 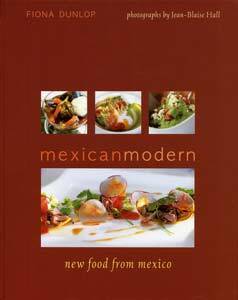 The variety of Mexico’s regional cuisines is huge, with 62 distinct indigenous groups thriving mainly in the center and south. Many feature in this book, beside other extraordinary recipes found on our epicurean path. From dynamic Mexico City to an eccentric hill village in Veracruz, to the traditional university towns of Morelia and Puebla, to the strongly indigenous Oaxaca and finally, to Mayan territory in the Yucatán. Whether up in the dry sierra or down on the tropical coast, some of the tastiest local food is found in markets, from the gamut of corn-based snacks such as tostadas, tacos, chalupas, panuchos, exquites, and uchepos, to countless regional specialities. The big change is that refined versions of these classics are now gracing the white tablecloths of Mexico’s ritziest restaurants. Chilies are omnipresent, but their balance is being orchestrated more delicately. Tender nopales (cactus leaves) sneak into sophisticated salads, earthy huitlacoche (corn fungus) is revered as the Mexican truffle, pepitas (pumpkin seeds) adorn meats, and silky yellow zucchini flowers blossom ad infinitum. Then there are the “new” hallmarks of the herb-and-spice department: hoja santa, a large aromatic leaf used to flavor or wrap fish and tamales; allspice berries; amaranto grains and leaves; dark red achiote seeds, and an indefinable herb, epazote. So far, innovative chefs have eschewed more extreme native fauna such as armadillo (a pork-like meat still popular in the Isthmus and Chiapas) and iguana (very big in Isthmus markets), although sustainably farmed iguana could well be the next low-fat alternative to chicken—it certainly tastes like it. What chefs have embraced with enthusiasm are pre-Hispanic fowl and game such as duck, turkey, and venison, moving away from the Old World stalwarts of beef, lamb, and pork. Desserts, other than the cake and sweet production of the convents, were never a Mexican forte as sugar had no place in the indigenous diet, but even that is changing. Nor can you sing the praise of Mexico’s beers too highly, from sunny Corona to golden Pacifico to the dark Yucatecan brew, León. Then there are the smooth, upgraded tequilas and, hard on their heels, estate-bottled mezcales, which sometimes slip into the cooking pan. Mexico’s palate-tantalizing riches seem infinite. Rumored to cure any sailor’s hangover, this soup is pure comfort, packed with tangy flavor and hot chili. The most important stage is the correct preparation of the broth and the jalapeño chilies. Use any seafood you wish, but make sure it is absolutely fresh. Heat the oil in a large saucepan, then add the onion, jalapeño chilies, garlic, and tomatoes. Fry over low heat until the onion has softened and the tomato has become a pulp. Add 1 3/4 pints (1 liter) of water, the cilantro, bay leaf, and some salt. Cover with a lid and slowly bring to a boil. 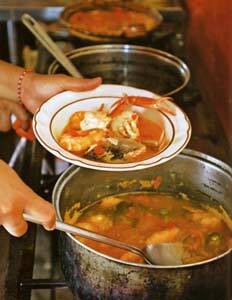 Carefully drop the seafood and trout into the broth and simmer with the lid on for 10 minutes or until cooked all the way through. Before serving, remove the bay leaf and add the lime juice.